SALT LAKE CITY Authorities are mulling whether to press charges against a Boy Scouts leader who purposely knocked over an ancient Utah desert rock formation and against the two men who cheered him on after they posted video of the incident online. Two of the men, who were leading a group of teenage Boy Scouts on a trip, said the top of the rock formation was loose and they feared it was dangerous. "This is about saving lives," Dave Hall, who shot the video, told The Associated Press on Friday. "One rock at a time." The rock formation at Goblin Valley State Park is about 170 million years old, Utah State Parks spokesman Eugene Swalberg said. The central Utah park is dotted with thousands of the eerie, mushroom-shaped sandstone formations. 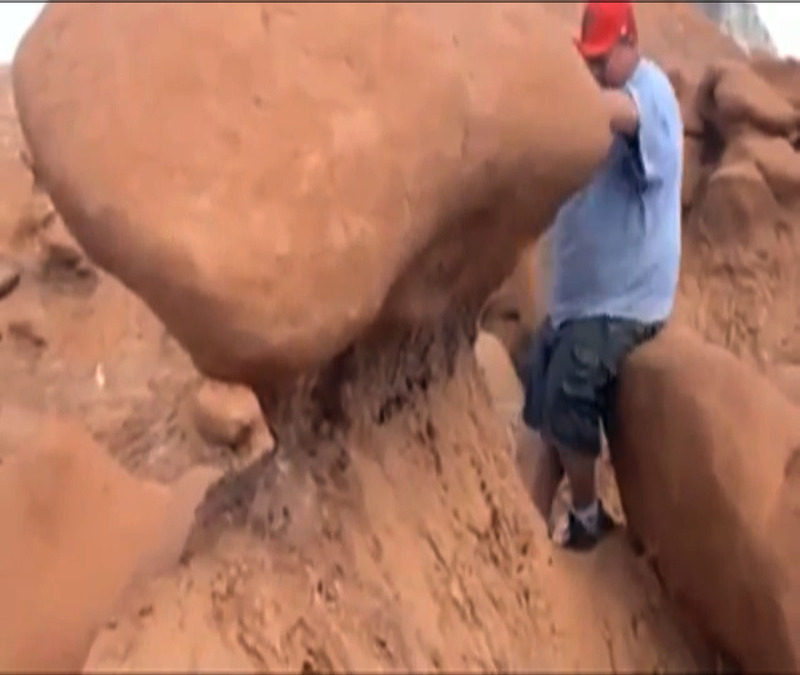 In a video shot last Friday and posted on Facebook, Glenn Taylor of Highland can be seen wedging himself between a formation and a boulder to knock a large rock off the formation's top. Taylor and his two companions can then be seen cheering, high-fiving and dancing. "This is highly, highly inappropriate," Swalberg told the Salt Lake Tribune. "This is not what you do at state parks. It's disturbing and upsetting." Hall, who also is a scoutmaster from Highland, said some of their Scouts were jumping on the structures and they noticed a large boulder atop one of them was loose. "My conscience won't let me walk away knowing that kids could die," Hall said. While safety was their motivation, Hall said, they reacted with high-fives and cheers in the video because of the adrenaline that came with what he described as a "crazy, exciting moment." Boy Scouts of America spokesman Deron Smith confirmed the men are members of the organization, and condemned their actions. He said in a statement that the organization is "shocked and disappointed by this reprehensible behavior" and is reviewing the matter to see if action needs to be taken. Swalberg said State Parks authorities are conducting a criminal investigation. The Emery County Attorney's Office also is reviewing the incident to determine if charges should be filed. Hall said the men now realize they should have contacted park rangers. He said they are sorry for the damage they caused and for any embarrassment they brought to the Boy Scouts. But, Hall added, "One more rock falling to the ground is not going to destroy the beauty of the park. Eventually, the erosion brings all of them down."